Action from Thorney's 1-0 home defeat at the hands of Moulton Harrox (blue). Photo: David Lowndes. Moulton Harrox have already opened up a five-point lead at the top of the Peterborough Premier Division. Harrox won the game of the day (September 8) in the top-flight with regular goalscorer Joe Townsend netting late on to secure a 1-0 win at third-placed Thorney. Action from the Peterborough Premier Division game between Thorney (orange) and Moulton Harrox. Photo: David Lowndes. That’s now nine wins from nine games for perfect Harrox who face another tough clash against a bang in-form Peterborough Sports Development at Broad Lane next Saturday (September 15). Sports have won six of their eight games so far with a strong Whittlesey Athletic outfit their latest victims. James McDonough, part of Netherton’s quad-winning squad last season, and Henry Nkobi scored the goals in a 2-1 win. Netherton retained second place at the weekend despite dropping points in a 1-1 draw with Stamford Lions at the Grange. Dillon Chipunza shot the city ahead in the second-half, but Michael Webb equalised for the Lions direct from a free kick. 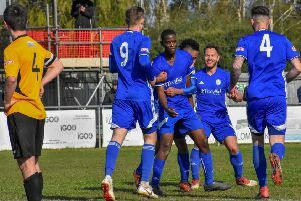 Benjamin Moore scored twice as ICA Sports won for just the second time this season, 3-0 at home to Sutton Bridge United, and Peterborough Polonia won a stormy game at Langtoft United 2-1 thanks to goals from Sebastian Bialoskorka and Dorian Janicki. Referee James Truman sent off three Langoft players in the closing stages. Johnny Allen scored twice as Holbeach United Reserves continued their fine start to the season with a 3-1 victory at Long Sutton Athletic and Ketton were 2-0 winners at Leverington Sports. Premier Division: ICA Sports 3 (Moore 2, Pierre-Liverpool), Sutton Bridge Utd 0; Langtoft Utd 1 (Dixon), Peterborough Polonia 2 (Janicki, Bialoskorka); Leverington Sports 0, Ketton 2 (Szymanski, Smitheringale), Long Sutton Athletic 1 (Shepherd), Holbeach Utd Res 3 (Allen 2, Davies); Netherton Utd 1 (Chipunza), Stamford Lions 1 (Webb); Peterborough Sports Development 2 (McDonough, Nkobi), Whittlesey Athletic 1 (Heron); Thorney 0, Moulton Harrox 1 (Townsend).